We’re back in the studio for episode 223 of The Stitch TV Show online quilt show! We’re talking about the value of value (and edge) in fabric choices and revealing the judge’s comments from our entries in the recent guild quilt show. This episode is brought to you by Ink & Arrow Fabrics, a QTFabrics company! The quilt hanging behind us is our new Emilio pattern! Check out more pictures of the variations or buy the pattern. Enter the Paloma fabric giveaway before August 9, 2017! Paloma was designed by Junebee for Ink & Arrow Fabrics. You can win 6 FQs and 1 yard of coordinating Pixie Dots using the Rafflecopter entry below. 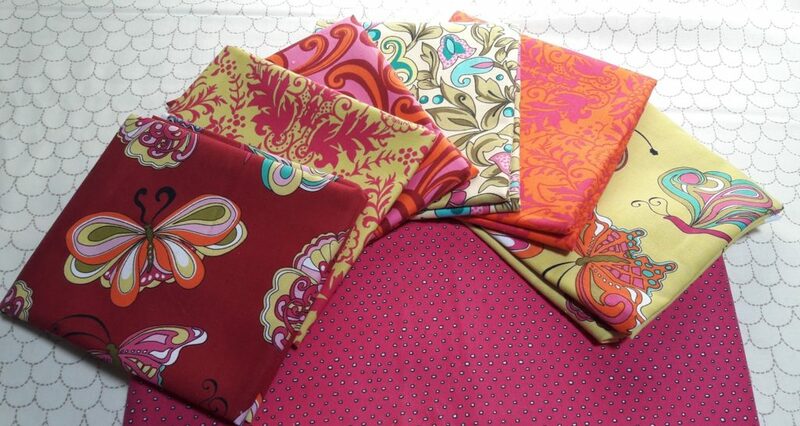 Alicia Jacobs Dujets designed the Mingle & Jingle fabric line we use in the value discussion. Learn more about her in our Sewlebrity Soft Pants Stitch-In interview! Bill Kerr of Modern Quilt Studio is an amazing teacher! Check out his and his partner Weeks Ringle’s book Transparency Quilts. Better pictures of our quilt show entries. Judge’s comments are not scary!! Coffee is Not My Cup of Tea by Lynn; this is her Castle Wall quilt, pattern by Mickey Depre. Pictures of this quilt will be available in a future episode! Today’s episode was brought to you by Ink & Arrow Fabrics, because fabric should be fun! Hst= it really depends on rhe project. Sometines i make rhem by 2s with a quarter inch on either side of the middle diagnol. Sometimes, ill do the by 8 method. Ive never tried the theresa down under method, where you can make a million at once and ive never tried thangles or the like. I alao want to add, off topic, but i found tou guys about a month ago and have binged watched tour show. You are so fun and have great energy. Thanks for sharing yourselves with us. I couldnt wait to watch this show and a giveaway to boot. Thank you! This fabic is very pretty! My favorite half square triangle technique is to cut 2 squares 1″ larger than the desired finished size, draw a diagonal line on the back, sew 1/4″ on either side of the line, cut on the line. If I want a lot of the same two fabrics, I might use another technique, but usually I’m going for a more scrappy look. Enjoyed your information on how judges judge quilts in a show. The way I always make my half square triangles is by cutting 2 squares 1″ larger than the finished size, draw a diagonal line on the back, and sew 1/4″ on each side, cut and trim. Thanks for the chance to win!! I have tried the triangles on a roll technique which is great for lots of the same fabric triangles when making a tree of life – i found a downloadable free one on the internet 😉 if i’m using charm packs i sew round the edge and cut in quarters which is quick but not so accurate. when i made my cushions i drew the diagonal line and sewed either side best if you are making random HST. Each method has its uses depending on the pattern you are trying to make. Is there one I haven’t tried? Mine is similar to Jenny, but I use The Angler 2. I tape that to the bed of my machine and I don’t have to mark. But I do make them slightly oversize and trim down. I have bought those half inch rulers made by omnigrid and promoted on Fons and Porter. You line the ruler up on the diagonal and draw a line on each side. The problem with that is that the ruler is exactly 1/2 inch wide, so your pencil lines are more than 1/4 inch from the diagonal. Ok if you have cut it oversized but if you only added on 7/8 then you have to sew inside your lines. My favorite method depends on what I am making. Chevron quilts – use a layer cake and 10″ background sq – place RST and sew 1/4 seam on all 4 sides cut diagonally twice (makes an X) press and then square each block you get 4- 6.5″ squares – Yes Pam they are all bias edges but I have never had an issue. I have also done this using other size squares but all with a single background color. Second method – mark the diagonal line sew eaither side and cut, press & square up – get 2 squares same colors. I use a lot of different methods depending on how many I need but I always make them bigger and trim down with Bloc Loc rulers. One exception I never paper piece HST, too much trouble. I haven’t made enough half square triangles to know my favorite technique. But the few patterns I’ve made with them, I preferred methods where the squares are bigger and then you sew either down the center twice or around the sides and then cut apart and square up. I have no favorite HST method. I’m not a very good cutter – so purchased Go Big so I can cut perfect triangles. Now to learn to sew them perfect. I make 2 at once by drawing a diagonal line and sewing to either side. Trimming after I sew is the key for me. Started using Bonnie hunters idea. Thanks girls love your shows. I love The Stitch TV show and Pam’s podcast Hip to be a Square. You guys are awesome and always entertaining!! I’m not as advanced a quilter as you all or the other folks leaving comments, so I don’t have a favorite way to make half square triangles…I just follow whatever pattern I’m using at the time LOL. That fabric brings out my inner hippie. I just want to add that I went to Ink & Arrow’s website and I completely understand Pam not giving up the Mingle & Jingle. I love to cut them oversized and trim them down using a bloc lock ruler! I cut the squares a bit too large (up to the nearest 1/2″ instead of the 3/8″ or whatever measurement), and then the HSTs sit in a pile for a VERY long time before I’m ready to trim them down. It’s such a tedious job, the trimming, but I like the precision it gives me (since my piecing leaves a bit to be desired). I don’t have a favorite method. Sometimes I want them scrappy and sometimes I want multiples of the same fabric combos, so I do whichever method gives me the amount I need with the various fabrics. Ummm, I don’t know! I just do whatever the pattern tells me. I’ve been quilting for years, but I’m still not all the experienced! I usually use my Accuquilt Studio to cut fabric for HST. I have dies for the common HST that I use in my quilts. Makes it quick and easy! Love you show and would love to win the fabric you have as this episodes giveaway. Triangles on a roll are great! I sew 1/4″ away the center diagonal, both sides. Then I cut on the center line to give me two half square triangles. I trim them to size using the Quilt in a Day square up ruler. This gives me perfect blocks each time. Depends on the project. If it is scrappy I will sew 2 squares together, 1″ larger than the HST I need, draw a diagonal line, sew a 1/4″ on each side, slice and square up. Only 2 are alike unless you want more to match. I like to take a quarter inch stick (can’t remember what the darn thing is called!) and draw a line on both sides, then sew down the middle. You get 4 1/2 square triangles. Thanks for the opportunity to win some great fabrics!! The Paloma Fabrics ate Gorgeous!! Oops! I forgot my favorite method my favorite method is paper piecing. It is so accurate!! It depends on the project, but generally sew 1/4″ from the center diagonal line and then cut on the line. I also make my half square triangles by cutting 2 squares, draw a diagonal line in the middle, and sew 1/4″ on each side of the line, and then trim to size to make then nice and neat. Thank you for the giveaway opportunity! Love that gorgeous fabric. Thanks for the chance at a great giveaway. My favorite half square triangle method is taking two large squares and marking lines for stitching and cutting a whole bunch of half-square triangles all at once – feels very rewarding! Love the show – I usually listen in the car.